Add Wisk with Heart Handle: NoYes (+.35) Label Color: Pale PinkPale BluePale GreenIvoryStrawberryTangerineLilacChocolateLipstick RedLemonGreyBlack Design: MonkeyElephantLionGiraffeButtlerflyPandaBirdieBunnyHorseyDinosaurBaby BearPuppyKittyBeeOwlLady BugLambChickFroggyDucky Text 1: Text 2: Date of Party: This item is currently out of stock! Treat your guest to something else they will ooh and aah over. Adorable sweet baby animal faces on these personalized BABY SHOWER MUFFIN MIXES. From a sweet little bird to a darling elephant, a full range of animals and soft-hued colors are yours to choose from to create the perfect label for your muffin mix party favors. 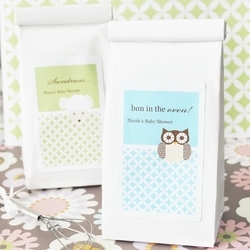 This endearing gift "bakes" a warm and delicious party favor for your baby shower guests. Personalize your Baby Shower Muffin Mix Favors with your favorite color, animal and mom's name. Your guests will love receiving this unique edible party favor! Create the perfect gift by pairing these personalized mixes with our optional heart handle mini whisk. Optional whisks come with a white satin bow and a heart shaped handle. Some assembly required (punching a hole in the muffin mix package and slipping the heart handle of the whisk through it).